Eryn Santamoor makes her pitch to potential voters at the residence of Democratic Committeeman John Zimmerman. 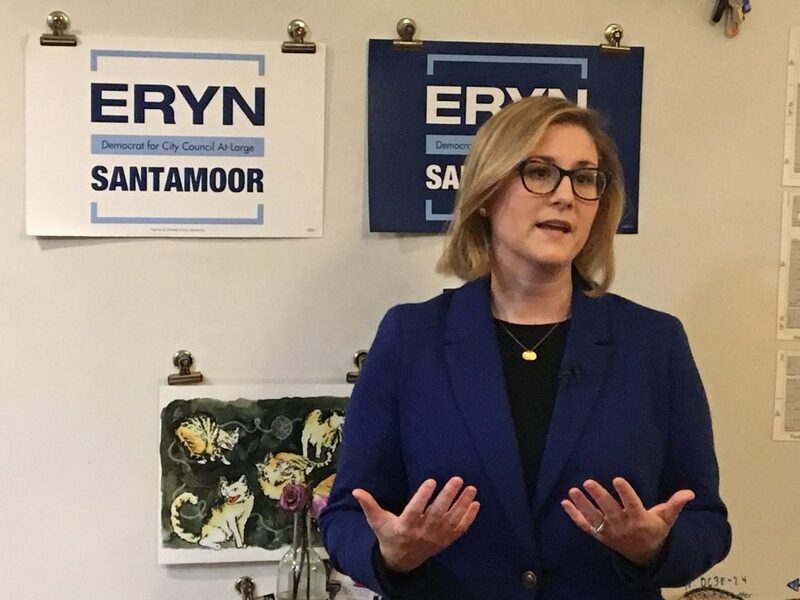 At-large Democratic City Council candidate Eryn Santamoor held a meet and greet with voters at the residence of 26th Ward Democratic committeeman John Zimmerman Tuesday night. At the meet and greet, she discussed issues related to trash collection, SEPTA, funding Philadelphia’s schools and the legalization of marijuana. Santamoor had previously served as Philadelphia’s deputy managing director from 2008 to 2014. Santamoor, who said she was involved in bringing Center City’s Big Belly trash cans to Philadelphia, believes trash is one of the biggest issues in the city. Santamoor said that while she was in favor of street sweeping, it was simply “treating the symptom,” not the root cause of Philly’s lack of cleanliness. She suggested that encouraging grocery stores and other business to stop handing out plastic bags could solve the problem as well. “We’ve got to sit down and talk with our grocers and store owners and get them off of plastic bags,” she said. According to an in-depth report from Billy Penn, Philadelphia is the only major city without a street sweeping program. Recent Philadelphia transplant Melody Imoh told Santamoor that “the biggest myth” she’s encountered so far about moving to Philadelphia was that she wouldn’t need a car. Imoh, who resides in Port Richmond, said that wasn’t the case in her neighborhood. Santamoor said that she supports more rapid bus lines and extending the subway system – including to the Navy Yard (although she noted that she didn’t expect much federal infrastructure money to come Philly’s way under the Trump presidency). She called Northeast Philadelphia “a great land of opportunity,” but also said “there’s no way to get there” except by car. In particular, Santamoor said she wanted more counselors in Philly’s schools. Santamoor said she was in favor of legalizing marijuana, but wanted to be sure that the public and especially children were educated about the negative effects of marijuana.